This is the conclusion of the Channel 4 documentary, ‘Africa’s Drug Scandal’ that I helped to coordinate through my work – the African Palliative Care Association. The documentary is due to be broadcast on Channel 4 in the UK at 7:35pm on Friday 30th May 2014. I am posting about it here because it strikes me as a rare opportunity to get a large number of people thinking about an issue that is incredibly important to me. The documentary focuses in on the issue of access to pain medications – predominantly oral morphine. Having access to such medication is something that most people in the UK take for granted. If you were diagnosed with a life-threatening illness tomorrow you would assume that you would be given the appropriate pain control that would firstly enable you to live your life to the full but secondly, would enable you to die a peaceful death. For the majority of people in the world this is simply not the case. Indeed, as ehospice reported last November, due to a lack of access to inexpensive and effective essential opioids more than 4 billion people, over half the world population, live in countries where regulatory barriers leave cancer patients suffering excruciating pain. In countries like Senegal where the documentary is set the situation is dire. Last October Human Rights Watch found that the government only imports about one kilogram of morphine each year – enough to treat about 200 cancer patients when there is an estimated need in the tens of thousands of patients! And so, this is one of the corner stones of my organisations work – to lobby, offer training, educate and empower people to ensure that everyone has access to the pain medications they need. 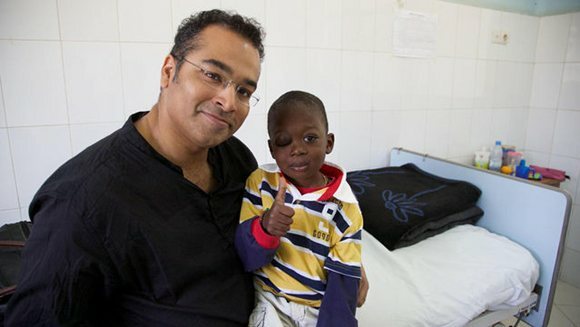 It might seem like an abstract issue, but as Krishnan Guru-Murthy, the renowned Channel 4 reporter finds out, once you see a patient suffering in unbearable but perfectly treatable pain you instantly understand the importance of the issue. Guru-Murthy concludes the situation amounts to “needless cruelty”. I find it impossible to see how anyone, when faced with this reality could conclude anything different. The programme can be watched live online here, on 4OD for 30 days after broadcast here, and you can read a preview in the Radio Times here.